Following the trend from last month, car sales in November 2018 have continued to falter with many manufacturers achieving a negative growth rate. Among the top six performers of the month, only Maruti Suzuki, which still remains the market leader, witnessed an increase in sales from October. While the domestic car sales have been under significant pressure, the month of November has only made things worse as it has turned out to be 2018's worst performing month in terms of domestic car sales figures. Compared to a total of 2,81,066 units sold in October 2018, the figure for November fell down to 2,63,455 units. Even on a Year-on-Year (YoY) basis, the picture remained glum as the sales figures for November 2018 were down by 8,351 units compared to those same time last year. Despite the underwhelming performance, here's a look at how leading car brands fared in the month gone by. Compared to the 1,35,948 units it sold in October 2018, Maruti Suzuki was among the few manufacturers to gain relief in November as it sold 1,43,890 units in the month. While the figures aren't its best by a longshot, the Manesar-based brand was still able to claw back a decent bit of market share with the year's second-best figure of 54.62 per cent for November (the best ever was 55.5 per cent achieved during April 2018). Considering October's figure of 48.37 per cent, this seems like a decent comeback. 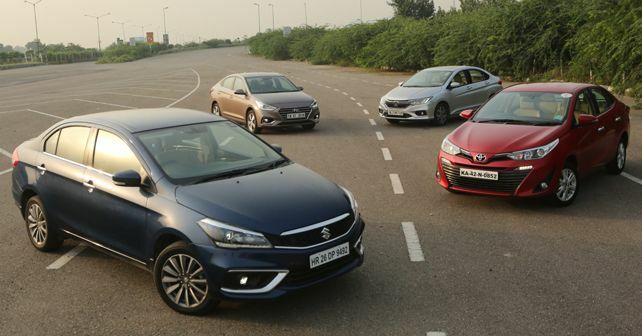 Maruti Suzuki captured the top six product positions with its 'Heartect' trio (Swift, Dzire and Baleno) rounding off the top three selling cars in November 2018. Hyundai's sales numbers for November witnessed a sharp decline as it could only manage to sell 43,709 units in the month. Despite selling 8,292 units less than October, Hyundai still remained the second highest selling brand in the country. Except for the newly-launched Santro, all Hyundai models witnessed a reduction in demand and surprisingly, the figures for Creta fell below the 10K mark for the first time since the launch of the facelift model. In the B1 segment of hatchbacks, Santro outperformed by selling more than its rivals like the Celerio and the Tiago and even made it to the top ten cars sold in the month. Tata Motors overtook Mahindra in November 2018 to become the third-highest selling brand of passenger vehicles in the country. However, compared to 18,290 units it sold in October, Tata sold 1,308 fewer units in November, leading to a negligible YoY growth. While a majority of Tata's models saw a reduction in demand, the Tiago and Zest turned out to be the game changers for the brand as both models registered a Month-on-Month (MoM) growth of 4.4 and 34.8 per cent, respectively. On the other hand, Hexa's sales figure fell below 500 for the first time since June 2018 to reach 487 in November. In the compact SUV segment, Nexon continued its strong run by selling more than 4K units and it has even outsold the Ford EcoSport four months in a row now. The month of November did not go well for Mahindra as the brand registered its lowest monthly sales figures of the year. At 15,155 units, Mahindra sold 7,408 units less than it did in October. Key models which can be attributed to this decline are the KUV100, TUV300 and the XUV500, which witnessed a Month-on-Month (MoM) reduction in demand of more than 50 per cent. However, the brand's best-selling passenger vehicle, Bolero and the new Marazzo MPV helped Mahindra retain its place in the top five selling manufacturers for the month. Despite a Month-on-Month (MoM) demand decline of 12.4 per cent, the Honda Amaze remained the brand's best selling model in November as well. Overall, the Japanese manufacturer sold 13,006 units in November, 1,181 units less than October. The Honda Jazz remained the only model to witness a Month-on-Month (MoM) growth of 35 per cent, while Honda City was the second-highest selling model in November from the Japanese stable, shifting 3,531 units.